You may find all the details of future EU fundings for 2014-2020 here. A more summarized and analytic content on European fundings will be soon made available to the network members (only). – one of the three decentralized funds related to European territory and social cohesion policies – directly managed by local regions in each Member State (Länders, French regions, areas…) which will represent about 376 bn euros – significantly more than Europe Creative. 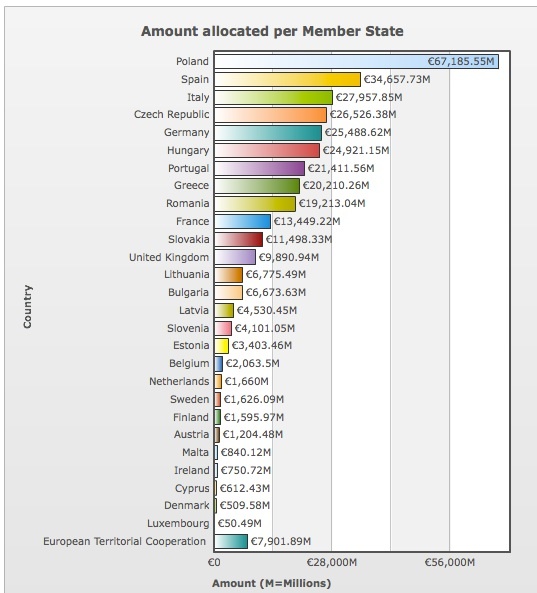 Amounts allocated per member states for the previous period 2007-2013 are available below and will give you an idea of what is at stake. For England, you will find the 2020 fund allocation per regions on this page. Culture has disappeared from the clearly identified objectives of these decentralized funds. The 2020 objectives vary according to what your member state has negotiated with the European Commission in their partnership contracts / partnership agreements. Please let us know which national organization of your country is relaying information of the partnership agreement content : for France, it is DATAR, for England, the European Funding Network. Following the definition of this national frame (for France : R&D, SME competitiveness, digital, energy transition), each appointed local area (region / Länder / etc.) will negotiate the possible funding allocations to local/regional projects, and present their own particular vision on how to use EU decentralized funding. Their decisions on how to use the decentralized fund should be accepted by the Commission and remain within the national framework that was set prior to their proposals.